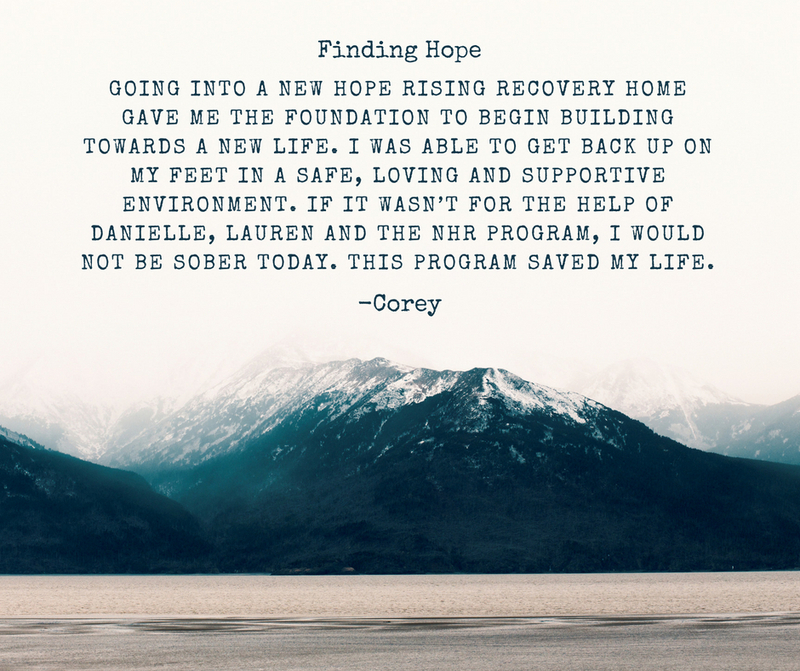 Unequivocally, I credit New Hope Rising to helping me to be able to maintain my sobriety. The individual care offered and various in-house wellness practitioners made available have been expreiences I would not have found elsewhere or even knew to seek out. They have all contributed to a healthier and more complete journey in recovery. With a long history of doing things my way, coming to NHR was not what I wanted- but exactly what I needed. My name is Drew, and I am an alcoholic addict. When I was asked to write about my story for this newsletter, I was a little hesitant because so much has happened in my life to sum up into two paragraphs! Where should I start? What will stand out? How can I be of help? I'm just a junkie.. right? Wrong. That was just a chapter or two in my life. I don't really like talking about my use because we all know how lives are ruined. I'm going to start at the end of my old life. I was homeless (again), broken mentally, physically, and spiritually alone. I was truly sick and tired of being sick and tired, and I made a decision to change my life. I gave the program a shot, figured... "why not, I legit have nothing to lose"... once I moved into NHR Recovery Housing, I dove right in. I got honest with myself, which was not easy, but as time went on it became easier. I did exactly what I was instructed to do within my fellowship and everything that Book has promised me is being fulfilled. Today, when I have a bad day, when someone close passes (RIP Pino), or have girl problems, ANYTHING; I know for a fact the steps I need to follow to help me through. Today, my priorities are in check: God, Sobriety. Everything else: family, kids, work. If it weren't for 1 & 2, there would not be a 3 I will leave it at this: no one has to die from this disease. We all deserve a good life, and we can all have one. 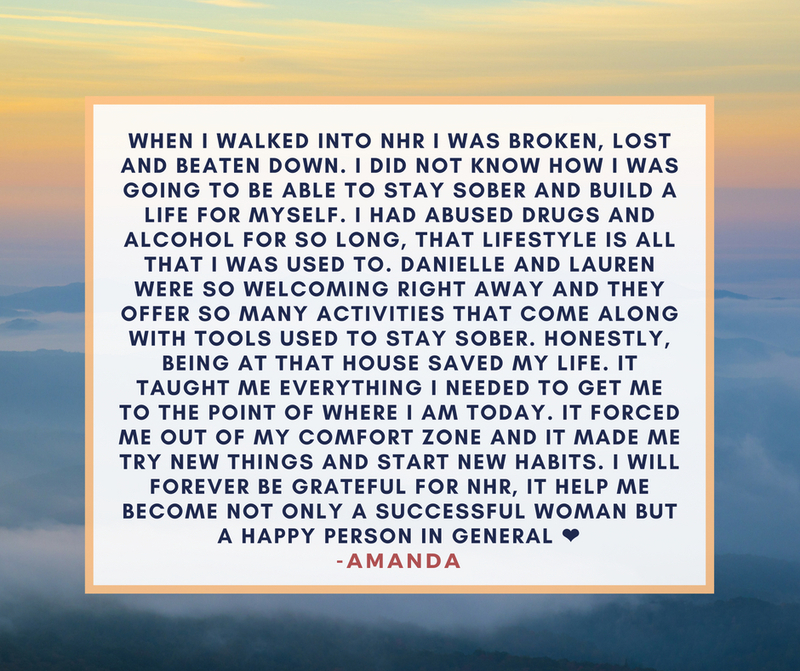 Coming out of inpatient treatment, I didn’t want to live in a “sober house,” but I quickly found that NHR was so much more than just a “sober house.” It’s provided me with so many rich, different opportunities to nurture and grow my divine creative energy as an artist, from daily meditation, to weekly reiki, to wholesome home-cooked meals at community dinner, among many others — that this transitional living space has felt more like a “recovery home.” At NHR, I found a fellowship of women committed to growth in sobriety, supportive of one another not only in recovery but in their attainment of life goals. Coming back into recovery after 3+ years of 12-step sobriety and a painful relapse was incredibly difficult. I know that the growth and development I experienced here has solidified my sober coping skills and fortified my sobriety — giving me the opportunity to use my education, work and life experience to explore new directions in life, one day at a time. I am grateful for Danielle and Lauren’s support at each step of the recovery process; their involvement and expertise has made the transition to healthy, sober independent living as easy and stream-lined as possible. 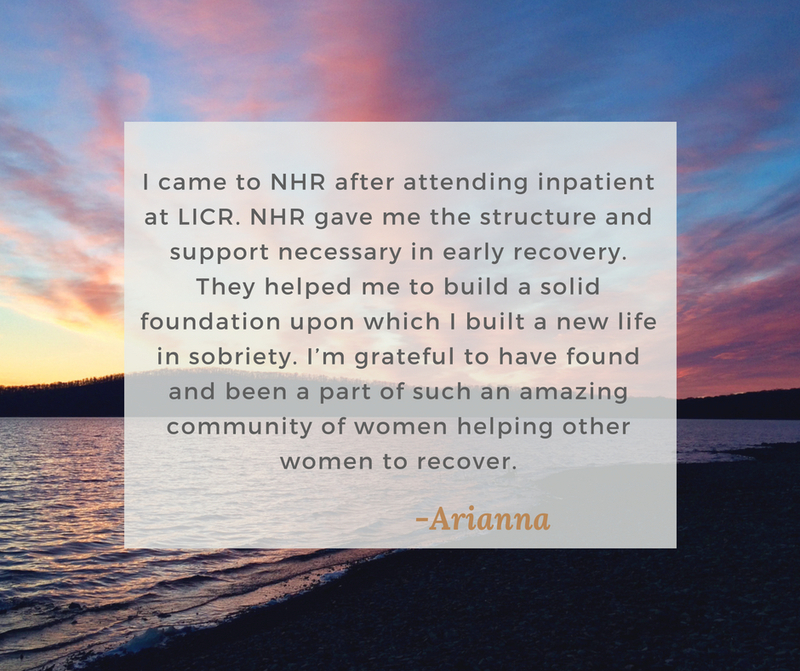 Both created an amazing positive community atmosphere; my recovery trajectory has been strengthened and expanded in the time I’ve spent in NHR. I called New Hope Rising when looking for recovery housing for my daughter. I was greeted by one of the Founders who told me of the philosophy and rules and regulations of New Hope Rising. A week later, my daughter and I drove directly from the airport to Mastic and found that all that Danielle told me was absolutely true. As a social worker/psychotherapist, I am always looking for what would most benefit my clients and their families. I typically stop at nothing until I reach the best resource. I am the same as a mother. I am like a lion watching and needing to feel safe and secure that my child is getting what she needs to help her recover from the devastating, chronic and sometimes fatal disease of addiction. When I met with the House Manager and the Founders along with my daughter, I knew we were in the right place. In addition to the rules of attending an outpatient program and an AA or NA meeting everyday, the residents participate in adjunct therapies including weekly yoga, daily meditations and other alternative healing methods. We know now that 12 step work is mandatory but there has to be more to fill the hole that the addict now has in recovery. By having nightly meals together, weekly “family meetings” and joint activities, New Hope Rising creates a family situation where the residents do not feel alone but filled. 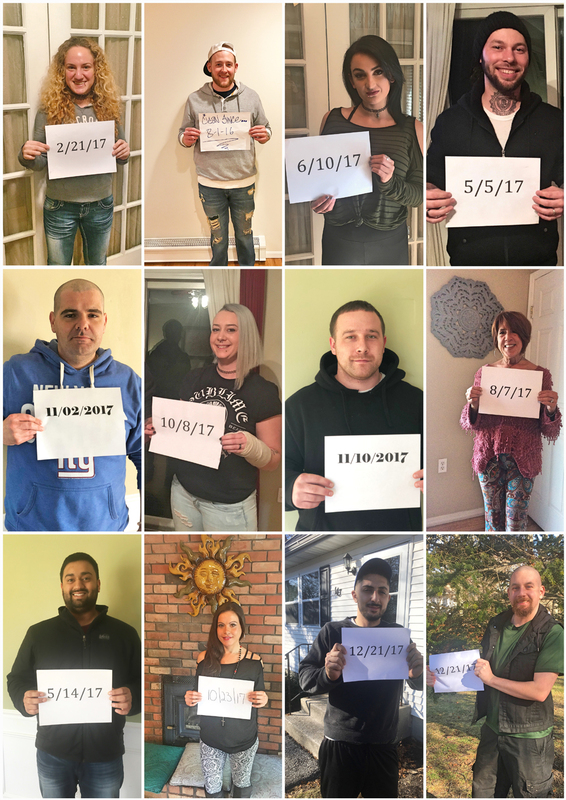 So it is with no doubt that I would recommend New Hope Rising to person and their family that needs to find a safe, responsible program dedicated to the health and recovery of addicts in need of sober living on Long Island.